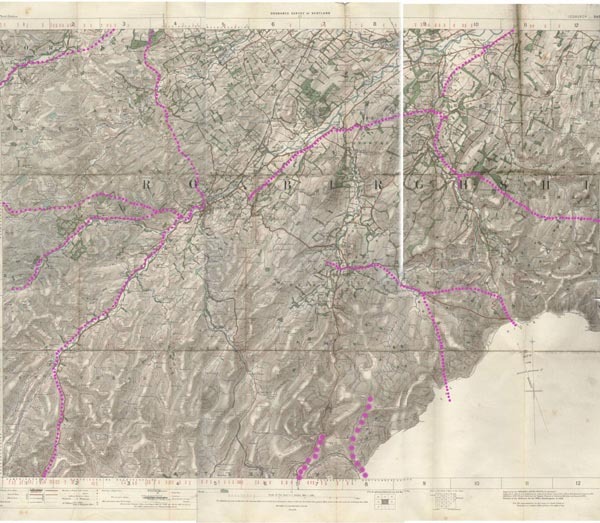 There is a major difficulty with this map in that it appears that several stretches of road have been omitted where other sources tell us that roads existed at that time or are likely to have done so. One glaring omission is the road south to Jedburgh - others are mentioned in the notes. There is in fact a slightly unfinished look to the Military Survey maps covering this area so it could be the work was rushed and the roads omitted. This road starts out as the road from Moffat to Selkirk, Melrose and Kelso. It leaves this road at Roundstonefoot (NT 140085) to run for about 2 � miles to Potsburn on a no longer existing track. From Potsburn it runs along the Ettrick Water Valley on the existing track for about 6 miles to join the B709 Selkirk - Langholm road at Ramsaycleugh (NT 274145). From this point it runs north-east more or less on the line of the main road as far as Crosslee (NT3018) where it follows the approximate line of the B7009 to Ettrickbridge and Selkirk. It enters the map near Kirkhope (NT3823), goes through Ettrickbridge End with its bridge and then 2 miles further on leaves the B7009 to make its way by a minor road and a track to rejoin the main road at Howden just outside of Selkirk. It may be significant that Roy�s route passes the site of a Roman fort and camp on this stretch. On leaving Selkirk this road takes a shorter line than the A7 by routing through Big Wood (NT4725) where it enters the map. It rejoins the main road at Haremoss, closely following it for about 3 miles and then heads directly for Hawick by still existing tracks. The route is the same as the first road above as far as where the B711 turns off the B709 just south of Crosslee. From there it follows the approximate line of the B711 to Hawick. There is a significant deviation from the B711 near Craig Hill (NT3216) where it cuts directly over to Delorainesheil. It then enters the area of our map at Bellindean Rig (NT3715) where it can be seen to deviate significantly from the B711 line. This is shown as running from Craik Moor (NT3105) up through Craik and Roberton to Hawick. It enters the map near Meadowshaw at NT3709. A Roman road is now known to have run from the fort at Raeburnfoot (NY2599) up through Craik Cross to the north-east. Wilson (Roman Penetration in E Dumfriesshire and Beyond, Allan Wilson, TDGNHAS, III, 73, 17) discusses the probable course of the road routing it up the Borthwick Water to head north of Roberton and across to Dere Street. The track shown by Roy is identical to or very close to the Roman road as far as Burnfoot near Roberton. Throughout its course it keeps to the north of the Borthwick Water unlike stretches of the modern minor road. The area can be accessed by the public road to Craik where there are Forestry Commission parking facilities. The road leaves Langholm on a slightly different course from the A7 but takes up the A7 line about two miles north of Langholm near Terrona. It closely follows this line for about 7 miles up to near Bught Knowe where it enters this map. Its course is then close to the A7 line but not always identical to it. Although not shown on Roy it is worth noting that Commonside Moor (NT4108) was used as an assembly point by drovers and that they crossed the Teviot at Northhouse (NT437080) from where they made their way over to the River Liddel. This ran by still existing tracks to Crailing and then onward to Kelso by a road that was later turnpiked. As will be seen from the map this ran across to Tow Ford (NT7613) where it joined Dere Street. Beyond the border this became known as Gamel�s Path. This is a puzzling route as there is no link between Hobkirk and Hawick. The road ran over towards Carter Bar taking a more direct line to the border south of Huntford. Stobie�s map of 1770 shows the road here to have run between Jedburgh and Newcastle but does not show the stretch between Lustruther and Huntford, north of Carter Bar. It is tempting to assume that the Military Survey omitted the Hobkirk to Hawick stretch as Hobkirk would hardly have generated enough traffic on its own. However, Stobie in 1770 has the link between these places but on a line about one mile south of the Roy road which may indicate that there was no road in the 1750�s. Although the remarks above also apply to this route it has at least a possible use for obtaining coal from the Kerryburn Colliery shown on Stobie�s map (NT6502). On Stobie�s map this road runs between Newcastleton and Jedburgh. On the Military Survey, the road is very isolated shown as starting at Kershopefoot, 3 miles south of Newcastleton and heading up the Liddel Valley to terminate near Caldroun Rig (NY5799) on the B6357. Again, it is puzzling that the Military Survey does not show the full extent of this road as Mackay (Border Highways, p.126) notes that Thomas Gardner�s road map of 1719 mentions the road as between Carlisle, Jedburgh and Berwick. The route was used by Bonnie Prince Charlie and his army in 1745. It is highly likely that it was no more than a track as the OSA (go to non-subscribers - browse scanned pages) in 1791 states that no roads had been formed in the parish until recently. This is shown as puzzlingly incomplete, appearing first near Needs Law (NT6102) and running south. In fact it was a well known road of mediaeval date with references to it in 1296 when it was used by Edward I and also in the early 1500�s. For many years it was thought to be Roman but this view is no longer held (see Mackay, Border Highways, p.31 for further details). Inglis in an interesting article (Harry R G Inglis, Ancient Border Highways; The Minchmoor (Catrail) Road, the Wheel Causeway, the Annandale Forest Road, the Well Path, and the Enterkin. (PSAS, Vol.58, pps 203-23)) argues that the OS map of the time was misleading by having the road head southward from Wheel through Deadwater to Tynedale (as on Roy). Rather he suggests that it went to Newcastleton and ultimately Carlisle. To the north he thought that it went by the course on modern maps to Cleuchhead (NT5910), then to Abbotsrule and Jedburgh and onwards to Berwick.